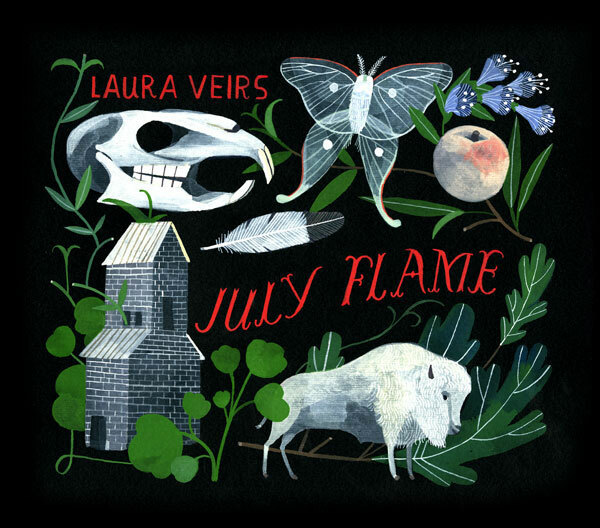 On the surface, Laura Veirs may look like just one of the typical “girl with a guitar” types, but dig just a little and you will find she is anything but. For instance, although she’s released eight albums and an EP since 1999, she didn’t begin writing songs or even pick up an instrument until she was in college. Also, despite the fact that all of her albums have been in the folk vein, she started off in a riot girl punk band called Rair Kx. She recorded her first album in one three hour session. She studied Mandarin Chinese in college and even worked as a translator for a time in China. See what I mean? Laura writes the kind of songs that really stand on their own when done solo and can also be nicely expanded upon with a variety of instrumental ornamentation. Her lyrics are easy to follow and get wrapped up in, but she’ll drop a thought provoking line on you before you know what hit you. Currently, my favorite song of hers is the whimsical tribute “Carol Kaye” off her most recent release, July Flame. Carol Kaye is one of those musicians that you may not have heard of, but you have definitely heard. Carol is a bass player that rose to prominence in the 60’s and has logged over 10,000 studio sessions. Easily one of the most well respected and widely heard bass players of all time, she’s played on some of the biggest records in history. Some of her bigger credits include “River Deep, Mountain High,” “Homeward Bound,” “You’ve Lost That Loving Feeling,” “Then He Kissed Me,” “I’m a Believer,” “Suspicious Minds,” a number of television theme songs and a ton of Beach Boys albums, including the legendary Pet Sounds. Laura not only picked an awesome icon to celebrate in song, she did it in a cool way by referencing a bunch of the songs Carol worked on in the lyrics. The bouncy, finger-picked musical history lesson is fun to listen to and it’s educational. Listen closely for some lush background vocals by My Morning Jacket’s Jim James as well. You can purchase Laura's music at www.lauraveirs.com and you can find out more about the legendary Carol Kaye HERE.